There are so many ways to save money on your groceries each month, but one of the most effective is by having pantry staples on hand. Pantry staples are the ingredients or food you have in your pantry, fridge, and freezer that make it possible for you to make a meal on the fly. These foods are very specific to you and your family, and you should not rely on others’ lists to make your own. By keeping your own pantry staples list for your family’s kitchen, you can save plenty of time and money. Read on to find out how! 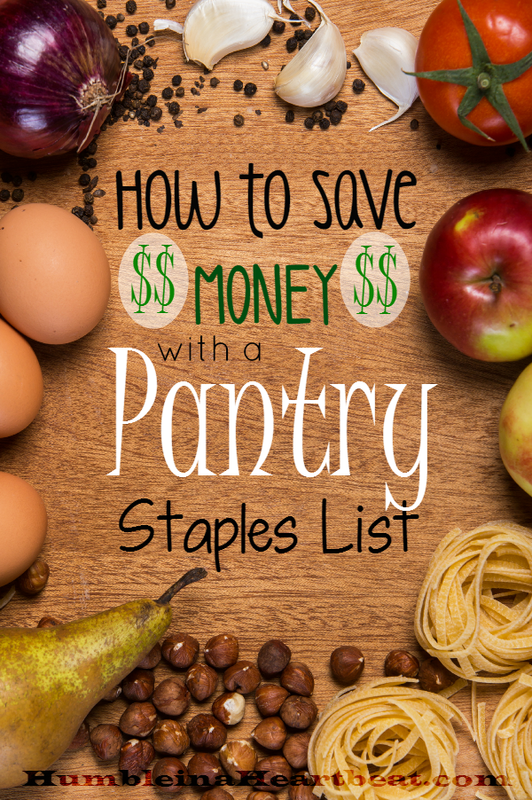 How Much Money Can You Save with a Pantry Staples List? 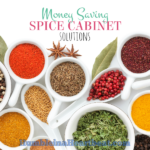 You can save a good amount of money with a pantry staples list. Not just pocket change but cold hard cash. Uh, who wouldn’t want to save $125 per month?! A lot of the headache of meal planning can be relieved by keeping a solid list of pantry items that your family eats regularly. Ever since this past April, I have been keeping track of all the dinners we’ve been eating. Although, for the last month it’s been hit and miss. 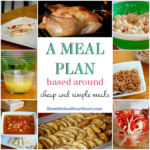 It has really come in handy when writing out a weekly meal plan. Because I’ve been tracking these meals, I was able to come up with a list of the meals we eat on a regular basis. Find the top 10 meals you seem to eat often, and list them out on a blank piece of paper with some space in between each meal. Now start listing all the ingredients it takes to make those meals. 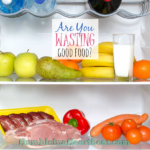 It can take you a good 15-20 minutes to write down all the ingredients for your 10 meals, but this is a critical step in order to fill out your pantry staples list. Here are 3 meals we eat regularly as an example for you. 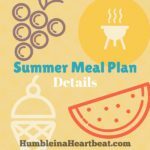 Finally, you will want to go through your list of ingredients from your 10 meals and put them on a pantry staples list (download yours here). I’ll share my list of pantry staples with you, but keep in mind that yours will be completely different. Remember that your family is unique and probably doesn’t eat the same things we eat on a regular basis. It’s best to find out your own pantry list by keeping track of what you eat on a regular basis and then writing down the ingredients that seem to come up over and over. Remember to write down pantry staples you use for snack, lunch, and breakfast items. After you’ve filled in your pantry staples list, put it on your fridge or in your pantry. 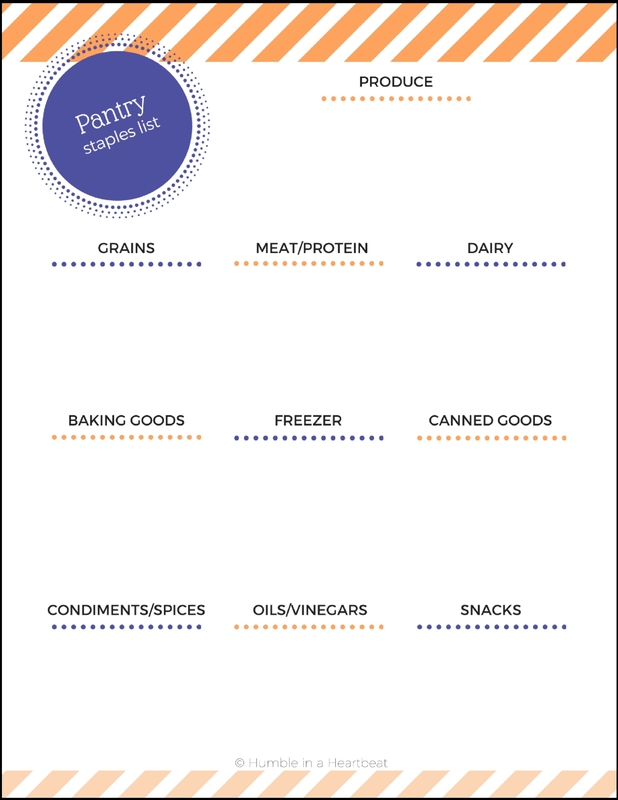 Every time you do your grocery shopping for the week, grab your pantry staples list and see if you need to replace anything. This Pantry Essentials Checklist from Food Network was a huge help as I made my own pantry staples list. What is the strangest ingredient you buy all the time? What a wonderful post and fabulous suggestions! 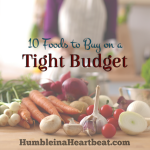 It’s my goal this year to trim our grocery budget. This will definitely come in handy. Pinned. Thank you for pinning, Jennifer, and I’m so glad it’s helpful. You’ll have to let me know if you were able to save money on your groceries with this. Great suggestions! I’m always a bit lost when it comes to this. Thanks for sharing and thanks for the printable! I’m so glad it’s helpful. Thank you for the visit, Jesenia! You’re welcome, Heather! I wish I had done started doing this years ago just thinking of all the money I could’ve saved. I often feel discouraged when I think of all the money I could have saved if I had known then what I know now. In an attempt to not get discouraged, I try to be thankful that I do know what I know now. Here’s to a prosperous New Year for all of us! You’re welcome! 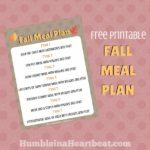 I hope it helps you save and plan meals better. Thank you for reading!